"A SORT of Paradise" was how that ardent hydropathist Dr. Richard Russell described Matlock half-way through the 18th century. Other writers have been equally enthusiastic. John Wesley found it "pleasant beyond expression"; Ruskin expressed his delight in both words and pictures; and Nathaniel Hawthorne had "never seen anywhere else such exquisite scenery as surrounds this village of Matlock." By "this village," Hawthorne probably meant Matlock Bath, then in its heyday as a spa. He may have been unaware of the seven other Matlocks, which, with eight more hamlets, now form a town of about 18,000 people. The local guidebook still speaks of "The Matlocks", but the average visitor is usually content with the generic name of Matlock. Scenically, it must be the most beautiful town in Derbyshire. It may lack the intimate charm of Bakewell or Ashbourne, or the architectural merit of Buxton, but no-one could dispute the grandeur of its setting. Much of it lies in a deep gorge of the Derwent that reminds you a little of the Wye gorge between Monmouth and Chepstow. The A6 trunk road shares the narrow valley floor with the river, forcing the St. Pancras - Manchester railway line to tunnel through the almost sheer limestone cliffs on the east bank. The buildings crowd along the roadside or climb steeply up the slopes of Masson on the west, where one man's front door may overlook his neighbour's rooftop, At the northern end of the gorge, where the road swings right to cross the river by the medieval Matlock Bridge, the sides of the valley are less precipitous; and on the east bank, town streets with revealing names like Bank Road and Steep Turnpike climb stiffly upwards on gradients of 1 in 6 or 7. If you drive up one of these streets and then work back to the south along the ridge towards Old Matlock, Starkholmes and Riber - or better still, park your car and go carefully on foot to the edge of High Tor (Fig. 5) - you may agree with Prebendary Gilpin that "it is impossible to view such scenes without feeling the imagination take fire." Peering down into the gorge, 400 feet below, or above it beyond Masson and the Heights of Abraham to the seemingly unending Peakland hills, you could feel with him that "every object is sublime and wonderful." Descent into the gorge may bring reservations, but much depends on the season. A weekend in high summer is likely to bring a sharp reminder that 5 million people live within 50 miles of Matlock and an impression that all but the bedridden have chosen it for their day's outing. It is wiser to go in spring or autumn, when the crowds and the commercialism are less obtrusive. That commercialism crept in gradually after the discovery in 1698 of a thermal water spring at what is now Matlock Bath. The earlier history of the Matlocks is obscure, Domesday Book records that "Meslack" was a berewick of the royal manor of Metesford (almost certainly Matlock Bridge), which had a lead mine, eight acres of meadow and some woodland but was otherwise "waste," and it had little else of note - except for the lead mines whose disused workings are the caverns now shown to tourists - until that momentous discovery in 1698. 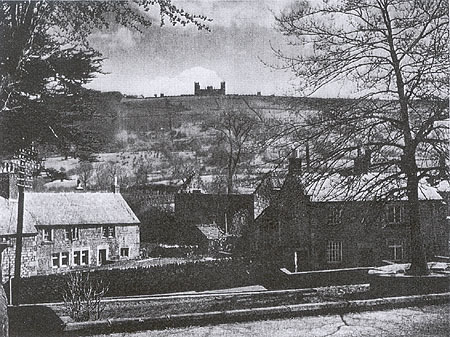 Even then prosperity came slowly, Defoe, some 25 years later, found that the spring had been "made into a very convenient bath, with a house built over it" ; but Matlock was far from being a rival to the established spas, He correctly attributed this to two causes: "namely a base, stony, mountainous road to it, and no good accommodation when you are there," though he heard of an intention to "build a good house to entertain persons of quality, or such who would spend their money at it." This intention was carried out in the 1730s with the erection of "two commodious buildings connected with the bath," which became, after the finding of other springs, the Old Bath Hotel. About the same time a coach road was built from the bath along the southern part of the gorge, to join a hilly east-west road at Cromford, and improvements made to the rocky bridlepath to Matlock Bridge. These challenges encouraged enough visitors to justify the employment of a "neat Orchestra furnished with a harpsichord and diverse other Instruments" in the Assembly Rooms at the Old Bath Hotel, where half a century later a youthful, love-sick Byron endured hours of jealousy watching the unresponsive Mary Chaworth dancing with other partners. Dr. Russell, drawing attention to the orchestra in the later editions of his Dissertation on the Use of Sea Water (first published in 1753), also remarked on the "Politeness of the Company and the easiness of the Charges," which amounted to 3s. a day for meals with free lodgings and bathing. At the end of the century, prices in the three good hotels were still reasonable - 5s. a week for a bedroom, 1 gn. for a private parlour, 4s. 3d. a day for meals and 6d. For bathing. But politeness was declining, according to the Hon. John Byng, who reported peevishly in 1789 that "by new buildings, and an increase of lodging-houses, the quiet and society of the place is lost, and it begins to become noisy, and divided into parties." There were good reasons for this growth. 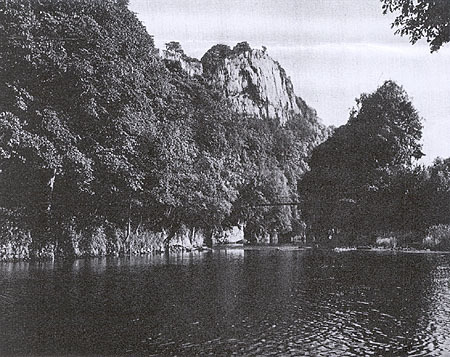 Not only was Matlock Bath sharing the increasing popularity of the English spas but its scenery struck exactly the right romantic note that the spirit of the age demanded. The Rev. Richard Warner was probably right in saying, in 1802, that "the larger number of visitors ... consisted of admirers of its beauties rather than drinkers of its waters." And for those who tired of both beauty and the waters there were, in addition to all the usual attractions of a spa, the spa shops, where ornaments were made from the local fluorspar and Blue John, and petrifying wells, where small objects could be left in the "petrifying" springs to become encrusted in carbonate of lime. 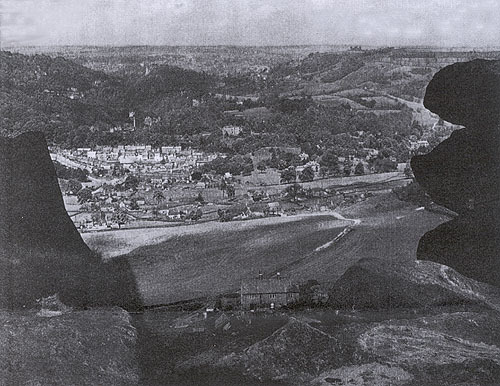 Despite such attractions, Matlock Bath remained a select resort, offering "gaiety without disputation, activity without noise" even after the cutting of the present road through the gorge in 1815 opened a way for daily coach services from Manchester, Nottingham and Derby. But its character changed when the shortlived Manchester, Buxton, Matlock and Midlands junction Railway drove 12 miles of line along the Derwent Valley from Ambergate to Rowsley, through the Matlocks. Opened in 1849 with great rejoicing (and free ale at the Old Bath Hotel), it brought Matlock Bath within reach of the day tripper from Derby and Nottingham. No longer intimidated by high coach fares, or by a change from train to canal boat at Ambergate and a tiring walk from the canal head at Cromford, they poured in their thousands out of the gay, Swiss chalet-style station at Matlock Bath, driving away those "persons of quality" who preferred to take their pleasures more quietly. Some of these refugees did not go far to find what they sought. At the northern end of the gorge, high above the railway, a new resort was springing up at Matlock Bank, which had much to offer them. Matlock Bank owed its growth virtually to one man, John Smedley, a rich, eccentric industrialist. Having by the middle of the century re-established a failing family hosiery business at Lea Mills, close to Florence Nightingale's home at Lea Hurst, he found a fresh outlet for his unflagging energy in the newly fashionable science of hydropathy. Convinced that his own health had been restored by hydropathic treatment, he saw water as a panacea. He contrived to get himself appointed as unpaid - and unqualified - medical adviser to the first small hydro at Matlock Bank, and within two years had bought the place. 3. 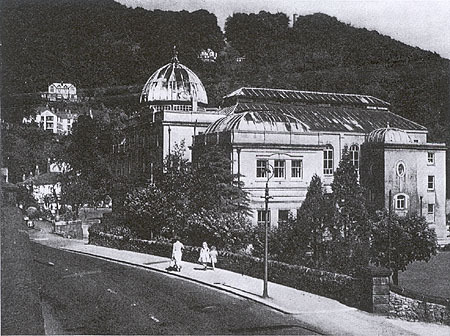 Spa Pavilion, Matlock Bath. Smedley's Hydro was immediately successful. Victorian England, it seemed, was full of hypochondriacs willing to pay 2 gn. weekly to live austerely in gracious surroundings for their health's sake. Some 2,000 of them yearly were soon finding their way to Smedley's, and expansion became necessary. Gradually there grew up the enormous, indigestible block of dark gritstone that still dominates the other buildings of Matlock Bank like a battleship surrounded by motor launches. It was designed by Smedley himself, never inhibited by self-doubts about his own all-round competence. He certainly managed the Hydro successfully, by giving his patrons just what he wanted. His rules were numerous and strict. Visitors began their day at 6 a.m. with a compulsory plunge into cold water and ended it precisely at ten at night. In between, they ate simple but ample meals, drank nothing alcoholic, and were forbidden to play cards or to hear any but sacred music - for Smedley numbered religious fanaticism among his numerous eccentricities. For breaking the rules they paid fines on a sliding scale ranging from one penny for lateness at meals to half a guinea for entering a lady's bed-sitting-room. But they not only survived this rigidly organised regime but returned repeatedly for more. Rival establishments sprang up, and Matlock Bank flowed downhill to merge with the growing shopping centre at Matlock Bridge, forming the core of the modern town, which looks today like a piece of deliberate - and rather unimaginative - town planning. You feel that the hillside setting demanded something more exciting than the too-regular grid pattern, which is so much less interesting than the enforced haphazardness of Matlock Bath. And the local gritstone - mostly from nearby Bentley Brook quarry - strikes a chilling note, especially when translated into municipal Gothic public buildings. The most interesting buildings hereabouts are the sheds and engine house of the defunct cliff tramway, which from 1893 to 1927 plied up and down Bank Road on an endless cable, worked originally by a stationary steam engine and later by a gas engine. The tramway was given to the town by Sir George Newnes who was born at Matlock Bath in the Old Manse (recently demolished), close to Sir Richard Arkwright's impressive Masson Mills (built in 1783). The tramway died because changing holiday habits were taking people away from the hydros, none of which now survives. Smedley's Hydro kept open until it was bought in 1955 by the Derbyshire County Council, which has injected new life into the town by making it the administrative centre of the county, so that today - with Matlock Bath still a holiday resort - there is no atmosphere of a decayed spa about the place. But to appreciate the Matlocks fully you must see it from above: from Black Rocks (Fig. 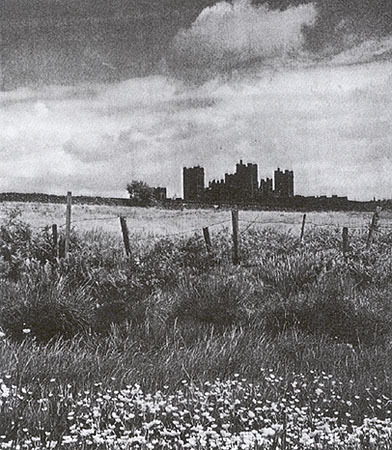 I), perhaps, for a superb long view; or better still from Riber, where another of John Smedley's memorials - a fantastic sham-Gothic castle - broods over the town from a wildly unsuitable hilltop site, 800 feet up. Originally, as the last of many philanthropic gestures that included the building of schools and chapels, he intended to build an observatory. But the site was wrong, and what emerged - six years before his death in 1874 - was this absurd castle (Fig. 2) whose inconveniences his widow loyally endured until her own death 18 years later. Since then, after serving as a school and a Food Ministry's store, it stood derelict until the British Fauna Reserve bought it from the Matlock Urban Council for £500 and opened it in April, 1963, as a nature reserve and zoo of British fauna. 5. High Tor and the River Derwent. Nathaniel Hawthorne wrote that he had "never seen anywhere else such exquisite scenery." It is reproduced here with the very kind permission of the author, Roy Christian, and the photographer, Frank Rodgers. With thanks also to County Hall LSL for providing the copy. Text OCR-ed by and © Ann Andrews. © 1996 - Ann Andrews | Contact Ann | Article © Roy Christian. All Rights Reserved.